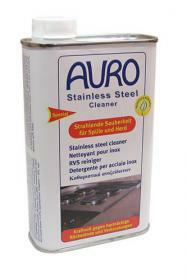 AURO 663 Stainless Steel Cleaner is both natural and eco-friendly. Stainless Steel surfaces cannot be regarded as completely maintenance free. All grades and finishes of Stainless Steel can indeed stain and discolour. Surface contamination in the form of small deposits are factors which can lead to a drastically reduced life of the stainless steel. AURO Stainless Steel Cleaner offers great cleaning results on stainless steel surfaces by gently and naturally removing even the most stubborn residues from sink units, ovens, pots etc.